Home > Shop By Brand > Wolfgang Concours-Series Car Care > Wolfgang Plastic Headlight Lens Cleaner 8 oz. Wolfgang Plastic Headlight Lens Cleaner 8 oz. 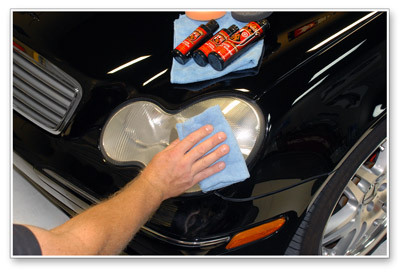 Wolfgang Plastik Lens Cleaner is a gentle, clarifying polish for your plastic headlight lenses. It removes surface contamination and the cloudy residue that covers the lens. This haze is caused by prolonged UV exposure, so it’s not something that sits on top of the plastic. It is a condition that affects the plastic from the surface inward. Catch it early, and you can remove all of the haze so your lens covers look like new. Wolfgang Plastik Lens Cleaner is step one in a two part lens clarifying system. Once you’ve polished your lens covers, step two is Wolfgang Plastik Lens Glaze. The surface may be slightly rough following polishing with the yellow pad. This is normal. Wolfgang Plastik Lens Glaze is a fine finishing polish that will smooth the surface of the plastic and restore the optimum clarity to your lenses. Use it with a 4” gray pad. 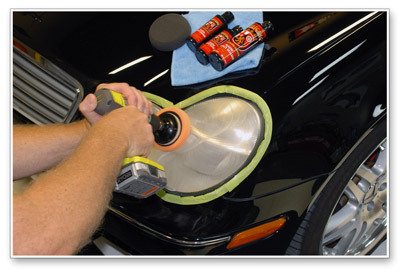 For exceptional results, seal your restored lenses with Wolfgang Plastik Surface Sealant. It will lock in the shine and clarity you’ve just created, or you can apply it to a new vehicle to prevent future damage. Toss your used pads in a solution of Wolfgang Polishing Pad Rejuvenator and water. Dilute one scoop per 3-4 gallons of water. You can cut the solution in half if you’ve only got these two pads to clean. Let them soak for 15 minutes and then rinse thoroughly. Let them air dry. I own a fleet of 9 vehicles and bought the kit 3 years ago to maintain all the lenses. I ran out of the cleaner and used a combination of wet/dry paper, compounds, polishes and elbow grease to replace it. Not one of my brain storms worked as well as this product. Don't ask me why but, this stuff just does something 'different' and it spoiled me rotten. ProsWorks fast and produces results as advertised. Do what you say you're going to do and you have a customer for life. I won't try or buy anything else again. ConsI suppose there has to be a con, right? Like most products such as this, it comes in a tall-ish slender bottle. I guess that makes it a better presentation for sales and more efficient for shipping but, if it was wider and a little more squat , it wouldn't fall over all the time. I would like that better but, that's just me looking for something to put in this box....there really isn't a 'con'.